*Please ensure that you make an appointment. Art Judaica Yavne or 114 Nahal Harif , Yavne. Take highway#4, (Ashdod Tel Aviv highway) toward Tel Aviv, take Yavne exit, right at the light, left at the light (You will see gas station on your left) go 1.6 km parallel to the highway heading north, ART is the last building on the right side, ground floor. 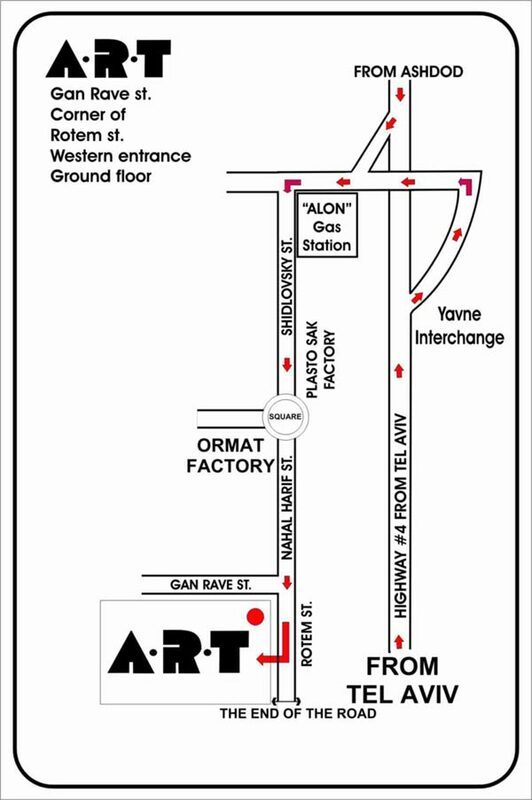 Gan Rave street & the corner of Rotem st.
ake highway #4, (Tel Aviv Ashdod highway) south toward Ashdod, pass Rishon Le-zion, take Yavne exit, left at the light, left at the 2nd light (You will see gas station on your left) go 1.6 km parallel to the highway heading north, ART is the last building on the right side, ground floor.